In a state renowned for ranching, beef, and bison under the big sky, you know you’re going to find awesome barbecue—from brisket and beef ribs to baby backs. For the best, sticky-fingered, saucy-cheeked barbecue in Montana, these are the places you need to go. The Notorious P.I.G. BBQ is routinely named one of the state’s best restaurants, so it’s a no-brainer that its barbecue is some of the best Montana has to offer. They start with top-quality meats. Then they tap techniques culled from a variety of barbecue traditions, from St. Louis to Kansas City, and Lubbock to the Lower East Side, to coax the most flavor from the meat. The results are mouthwatering. Barbecue lovers in Billings need look no further than Blues BBQ to satisfy their smoked meat cravings. Everything on the their menu, including ribs, ham, turkey, and sausage, is smoked to perfection and sauced to order. Of course, Blues BBQ also serves brisket and pulled pork. You can even get beef jerky by the pound. The proprietors of Moose Creek BBQ are north Georgia natives and competitive pit masters. When they opened their restaurant, they were looking to bring some authentic Southern barbecue flavors to their home of Hamilton. And fortunately for Hamilton, they’ve succeeded deliciously. I've been waiting all year for this!!! Delicious 14 rib dry-rub rack of babyback ribs, 6 different sauces, BBQ beans, cornbread, Texas toast, broccoli and Cold Smoke Scotch Ale! 👀👀👀😆 Absolutely amazing!!! Montana’s capital can count itself fortunate to be the home of Bad Betty’s Barbecue, one of the state’s award-winningest, savory, saucy, barbecue joints. They describe themselves as “urban southern barbecue,” but don’t be offended: You can get your hands and face as messy as you want. If you’re looking for the best barbecue in Big Sky, giddy up to the Gallatin Riverhouse Grill. Not only do they serve up barbecue standards like ribs, chicken, sausage, and brisket, they also offer all of the traditional sides you hope to find in a classic joint, like fried okra and cornbread. Cherries BBQ Pit slow smokes their meats daily, starting long before they open for business, over real fruit wood. This gives their ribs, chicken, and pulled pork their distinctive, one-of-a-kind flavor. All of Cherries’ sides, from chicharrones to bacon cream corn, are made from scratch daily. Folks looking for homegrown, family barbecue in Northwest Montana can satisfy their cravings at the Desoto Grill in Kalispell. 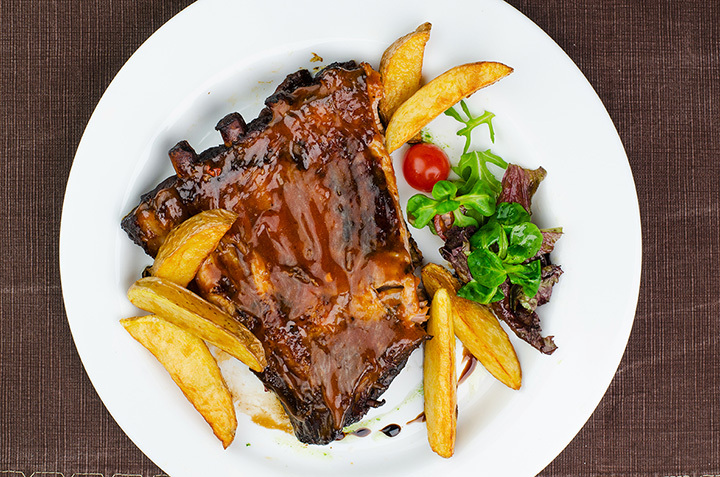 They mix classic barbecue fare like beef brisket, pulled pork, ribs, and chicken with Montana staples like elk sausage and salmon. And don’t miss out on the pork belly collard greens. Steak night at Desoto grill. Every Saturday. Long Riders has a little bit of everything from burgers and pizza to sandwiches and tacos. But where they really shine is their barbecue. They serve up succulent pulled pork, smoked chicken, beef brisket, and locally-adored hot wings. And, yes, of course, you can get saucy slabs of hickory smoked ribs. Beer lovers will enjoy Follow Yer’ Nose BBQ for their selection of more than three dozen beers. Everybody—including vegetarians—will enjoy this Paradise Valley joint for their delicious barbecue. They smoke everything from steak and sausage to brisket, chicken, ribs, and portobello mushrooms. ‘Que connoisseurs in Billings are blessed with another eatery that serves up some tasty smoked meats: I’m Cravin’ Bar-B-Que. Ribs, brisket, pulled pork, chicken, and sausage are all smoked until juicy and served hot. Be sure to try the porky mac and cheese when it’s available!